This week was knocked of course a little by the fact that I caught a small head cold early in the week. It took all the will power I had to actually take a whole extra day off from training to try and fight the cold. Luckily, since I don’t get sick often, I was able to fight the cold pretty quickly and get back to the schedule. I also had to split up my Thursday double over onto Friday. 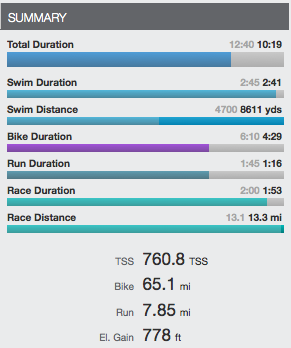 When I went back and looked at my training over the last two months I actually had only missed one or two open water swims due to bad weather. I am really proud of how well I have stuck to my plan since I recovered from my bike crash week one. This week was my last week swimming with Tower 26 this year. That experience has been amazing! I have met some of the nicest people in the group and I am 100 times more comfortable swimming in the ocean now. It was one of the best things I have added to my training this year. 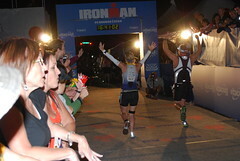 I may be taking time off Triathlon after this race but I have a feeling I may be swimming with them next summer anyway! This week ended with a race. Just a half marathon but it was the same race where it all began. 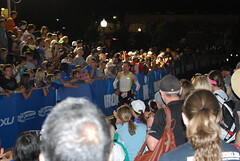 I ran my first half marathon in 2006 at the Santa Clarita Half Marathon. I had no idea that it would lead to all of this. It was a great day for a race and I had so much fun! (See my race report) But to summarize, I ran faster than I expected to and it was kind of easy. One of my friends commented on my time and said it looks like I am ready for an Ironman!